Port 0 Digital I/O Channels— You can configure each signal individually as an input or output. Port 2 Digital I/O Channels—You can configure each signal individually as an input or output. Programmable Function Interface Counter or Digital I/O Channel—This pin is configurable as either a digital line or an event counter. As a digital line, this signal can be used as an input or output. As a counter, this signal can be used as an event counter input source. +5 V Power Source—The voltage source provided by the USB host. The voltage is nominally 5 V, but varies from system to system. 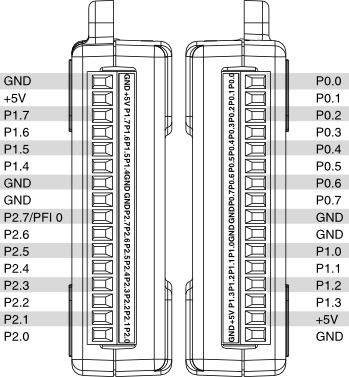 Ground—The reference for the digital signals and the +5 VDC supply. On Device connected but not initialized, or the computer is in standby mode. In order for the device to be recognized, the device must be connected to a computer that has the correct driver version installed on it.